Our Reviews Of The Top Doll House Kits on the Market Today! We Have Reviewed Some of the Best Dollhouse Kits on the Market Today – Are You Crafty? What is a dollhouse kit? It is in fact a dollhouse that you assemble yourself. 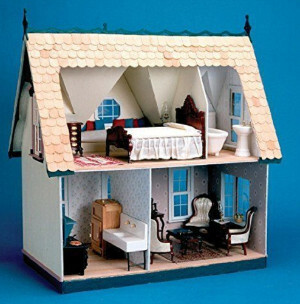 Most traditional dollhouses come in this format where you have to actually build the house, paint it, decorate it and furnish it all on your own. This is a great project if you are crafty and enjoy working on something over a longer period of time. If you have an eye for creativity and love dollhouses, or if you just want to make a present for a lucky kid, here are some dollhouse kit options to choose from. 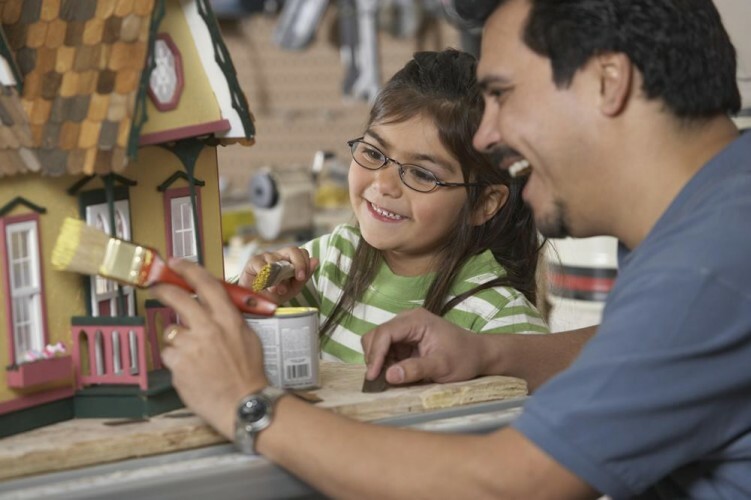 Besides getting to do some arts and crafts, some of these dollhouse kits are actually cheaper than some of the doll houses already made that are on the market. You might want to spend more money on dollhouse accessories. 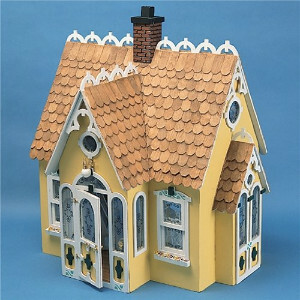 The Greenleaf Arthur Dollhouse Kit is an adorable Victorian style cottage that is a longtime favorite Greenleaf product when it comes to their loyal customers. 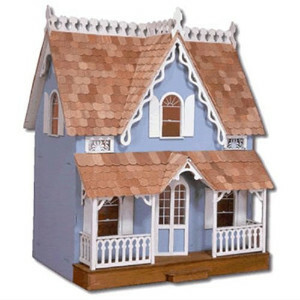 The Greenleaf Arthur is a great dollhouse kit for the new collector since it is smaller in size. Some features include silk-screened windows, a front porch, and four rooms. The gingerbread trim on the ridge and roof makes this the perfect house for Christmas decoration. Once assembled, the house measures about 23 ½ x 18 x 13 inches. If you are a first-time dollhouse builder, the Greenleaf Arthur house is a great place to start. According to one reviewer, the only downside was that the wood used for the external decorative elements, i.e., the porch lattice, windows shutters, etc., is extremely porous. It is difficult to sand or get a nice finish on those parts. But it is reasonably priced for a pretty little dollhouse and there are plenty of accessories that you can buy separately to decorate this home to fit your personal taste and style. 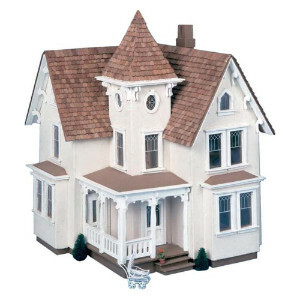 With this Greenleaf Corona Dollhouse Kit, you can build a Victorian-style dollhouse that has four rooms over two levels. The house features a bay window, double-hung style windows, and ornate trim. The dimensions of the kit are 17 x 22 x 2 inches and the dimension of the dollhouse once built is 21 x 21 x 14. The main point to make about this kit is that is not suited to novices. It is better suited for people who have previous experience of building a dollhouse or have similar arts and crafts experience. The main reason for this is the plans are difficult to follow if you have not undertaken a similar project before. However, if you do have the skills, then this is a pretty little doll house when completed. This Victorian style dollhouse makes a stunning centerpiece for a table once completed and will be a huge talking point if you invite guests around to your home. It comprises six rooms on two levels and also boasts two large hallways and an attic. Features of this dollhouse include four fireplaces, a wraparound porch, and a tower chamber. The dimensions of the Fairfield Kit are 22 x 17 x 3 inches and weighs 13 pounds. Although there are some complaints that this dollhouse is complicated to construct, the manufacturers recommend this only suitable for people over the age of 12. Realistically, it is ideally suited to adults with crafts experience. It is important to note that this dollhouse is ½ inch scale and not 1-inch scale. Some customers did not realize this and were surprised by the small size. Despite these issues, this little house is perfect for keen hobbyists and the finished piece looks fantastic on display. This is a Greenleaf Wooden Dollhouse Kit. As this pretty dollhouse only consists of one large room and an attic, it is ideal for creating a house, a shop or a single room. You can adapt the basic design to make your own customized creation. The dimensions of this dollhouse once built are 18 x 16.5 x 11 inch and it weighs 4.59 pounds. The makers recommend this kit for people over the age of 14, so it is really a dollhouse for adults. The interior and exterior features of this dollhouse add to its appeal. These include fireplaces, window seats, a curving staircase and bookcases on the interior. Exterior features are the bay windows, gable trims, and window boxes. There are two negative comments made about this kit. The first is that the pieces are fragile and can snap when punching them out. This is easily avoided by pushing gently in the corner of the pieces rather than the middle. Also, this is a complaint that is made about many other dollhouse kits. The other issue is the complex assembly instruction with no pictures. Again, there is a solution to this problem as there is an online pictorial guide that shows you exactly how to build the kit. This kit creates a single room with just two sides rather than a full dollhouse, so it is one of the most basic products. The bedroom scene comes with lots of accessories, so you can customize it to suit your taste. The dimensions of the completed dollhouse are 5.7 x 4.13 x 4 inches. From the appearance of this basic one-room dollhouse, it seems that this is a project suitable for children. However, people who have purchased this product and built it say it is definitely not something a child would enjoy. Furthermore, the packaging clearly states that it is only suitable for people aged 14 years and over. As it is just the one room, it may be a project for someone to try before attempting to make a full dollhouse. With the name in the title, this house could make a good Valentine’s Day gift. If not for your sweetheart, then for the sweet child in your life. But even though this dollhouse kit is targeted towards children, be aware that there are small parts that can be a choking hazard for smaller children. The Miniature DIY Kit Light Alice Love Home measures about 17 x 9.5 x 6.5 inches when fully assembled. 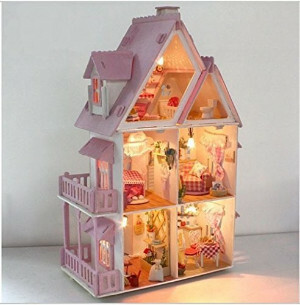 The DIY Kit Alice Love Home is a beautiful dollhouse that has real lights throughout. It has seven little rooms and a double wrap around porch. You can put it on the table or hang it on the wall. But you may need some scissors, tweezers and sandpaper in order to put it together. The one thing that every DIY dollhouse enthusiast needs to build a dollhouse is a dollhouse toolset. 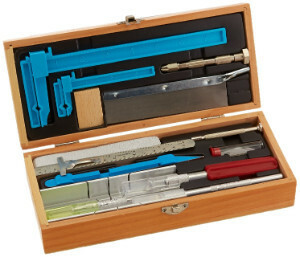 The Excel 44288 Deluxe Dollhouse Tool Set has just about everything you need. Included in the set are three assorted blades, three assorted drills, one sanding block and wedge, one sanding stick, one pin-vise, one B490 saw blade, one small clamp, one large clamp, one K1 light duty knife, one K5 heavy duty knife, one mitre box, one regular screwdriver, one awl and one 6” ruler. The dimensions of the toolbox are 10 x 4.5 x 2.25 inches. People who have bought this tool set claim it has all the tools they need and some they didn’t even know they needed. If you are planning on building more than one doll house, then making an investment in this tool set is worth your while. If you want to build your own dollhouse rather buy a ready-built dollhouse, there are lots of different options available with dollhouse kits to build for all abilities and using a variety of different materials. The best dollhouse kit really depends on your skill level and what you expect from the finished dollhouse. The first point to make is that all of these dollhouse kits are within a reasonable and affordable price range. 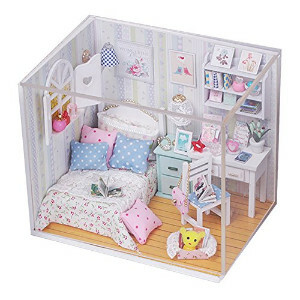 However, those who are looking for cheap dollhouse kits should consider the Cuteroom Dollhouse Miniature DIY House Kit Cute Room with Furniture and Cover Artwork Gift or the Buttercup Dollhouse. 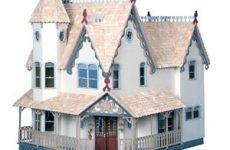 Size may be something that influences your decision when choosing the best dollhouse kit, so it is worth taking into account that some houses are miniatures. For example, the Greenleaf Fairfield Dollhouse and the Rylai Romantic Café are miniatures rather than full-size dollhouses. Regardless of which of the kits you choose, it is worth investing in a dollhouse tool set, such as the Excel 44288 Deluxe Tool Set. How Long Do Girls Play with Dollhouses? – Find Out Here! Most Affordable Dollhouses of 2019 – Check Out Our Top 9! Top 6 Interactive Dollhouses for Kids – We Show You the Best Ones! Best Barbie Dolls for Boys – We Find the Top 8 Barbies for Boys of All Ages! CoolDollHouses.com is a participant in the Amazon Services LLC Associates Program, an affiliate advertising program designed to provide a means for sites to earn advertising fees by advertising and linking to Amazon.com. Amazon and the Amazon logo are trademarks of Amazon.com, Inc or its affiliates. Copyright © 2019 Cool Doll Houses for All Ages. All Rights Reserved.